I did not visit the Moroso showroom looking for a tea service but I found one. (Note: I did not purchase this service!) The Moroso showroom in New York's SoHo has a 21-piece Madame de Pompadour (nee Poisson) Tea/Breakfast Service by Cindy Sherman (1990) and produced by Artes Magnus, USA. The service is for sale for $7,000. The original service, according to the Barbara Krakow Gallery, was commissioned in 1756 and the image on the service is of the artist dressed as Mme. de Pompadour. More images of Sherman's service can be seen here. In "Porcelain Stories," the Seattle Art Museum described Mme. de Pompadour as "the greatest benefactor of the porcelain manufactories of France." In a history of porcelain tea ware, Sakuraba Miki (trans. 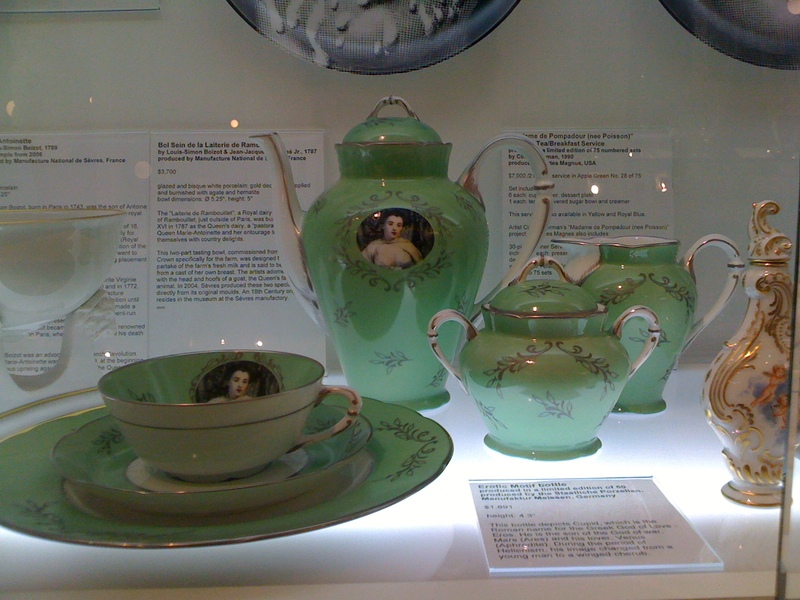 Jenine Heton) noted that dejeuner or breakfast services for tea or coffee was developed at the Vincennes porcelain kiln in 1753; the kiln moved to Sevres three years later and became the porcelain factory of choice for French royalty, including Madame de Pompadour. What differentiated this new tea service from the prior one was the inclusion of a matching tray thus "elevating the level of refinement of form to new levels and unifying the design of all included tea ware."